The rich President of Uganda. President Museveni has sponsored 103 Muslim pilgrims to the Holy City of Mecca for hajji, the annual Islamic pilgrimage. Although it’s not yet clear how the beneficiaries were selected, the delegation of 68 male and 35 female pilgrims led by a senior presidential advisor on political affairs and State minister for Micro Finance Haruna Kyeyune Kasolo, departs Entebbe International Airport for Saudi Arabia today for the hajj ceremony expected to begin on September 9. A statement released yesterday and signed by Mr Rogers Mulindwa, the information and communications officer at the NRM Secretariat, did not explain how much the President is spending on each pilgrim and whether he is using his personal money or state resources. Some of the happy muslim pilgrims. “NRM pledges its continued support towards the promotion and protection of the freedom of worship among Ugandans and will always place its keen eye on encouraging unity among believers of different religious sects,” the statement read in part. The annual hajj pilgrimage is one of the five pillars of Islamic faith. According to Islamic doctrine, every financially stable Muslim is duty bound to visit Mecca at one point in his or her lifetime. Because of the big sums involved, some Muslims cannot afford. Officials at the NRM secretariat declined to reveal the cost of the sponsorship. However, a hajj costs about Shs15 million per person minus pocket money. It, therefore, cost Mr Museveni about Shs1.54 billion to sponsor the pilgrims to Mecca, exclusive of the related costs such as pocket money. The party also declined to reveal the source of the money. Sources told Daily Monitor that each of the 103 pilgrims were given “everything”, including upkeep. Mr Mulindwa explained that Mr Museveni was making the sponsorship in his capacity as the NRM chairperson and that party members across the country were beneficiaries. “They were selected countrywide but they are basically party members. We would love to take more but this is the first time and if resources allow in the future we shall take more,” he said. When contacted yesterday, Hajj Nsereko Mutumba, the UMSC spokesperson, welcomed the move. Uganda’s Financial Intelligence Authority has formally begun preliminary investigations that will dig up details of the 57 people linked to Uganda, with secret accounts in HSBC, a Swiss bank. Speaking to The Observer yesterday, Sydney Asubo, the FIA executive director, said the investigations will look into who these people are, how they are linked to Uganda, and if they are hiding illicit money. Asubo added that while it is not illegal to have foreign bank accounts, the money laundering law empowers FIA to investigate any suspicious money. Early this month, HSBC’s secret files of over 100,000 clients were leaked to French authorities who also distributed them to different media outlets. The leaked files reveal that 57 out of the 100, 000 clients have links to Uganda, and they hold a stash of $89.3 million (about Shs 255.6bn) in the bank. One of the clients, whose association with Uganda is closer, has about $8.8m (about Shs 25.1bn). Details from the leaked files show that 212 bank accounts were opened by people with links to Uganda, of which 83 accounts were opened between 1972 and 2006, and 50 of those accounts were active in 2006, which was an election year. “We have to find all the illicit money wherever it is, whether within Uganda or out of Uganda,” he said, adding that in case it is discovered that the money is illicit, any individual or institution responsible will face the law. Asked about the status of the inquiry, Asubo said they were in the preliminary stages of the investigations. “We have written to Swiss authorities and we hope to update you if any substantial details are found,” he said. FIA will be assisted by other state organs such as the external security organisation and police. In 2012, Parliament established an inquiry into allegations that senior government officials had received bribes from oil companies to swing oil contracts in the bribers’ favour. In its report to Parliament, the probe team said it could not pin the government officials because the countries, Switzerland inclusive, where the accounts of the said transactions took place, refused to cooperate with the team. The commissioner for Land Registration department, Sarah Kulata has denied responsibility in the Shs 26bn loss made by government in the fraudulent compensation of more than 180 people alleged to own land in wetlands and forest reserves. In 2013, people were issued with land tittles and later compensated by the Uganda National Roads Authority (UNRA). Evidence before the commission of inquiry into mismanagement, abuse of office and corrupt practices in UNRA; indicates that the land registration department went ahead to issue land tittles in wetland and forest reserves without consultation with environmental body, NEEMA or the National Forest Authority (NFA) who are legally the custodians of wetlands and forest reserves respectively. Kulata however told the commission on Friday while being interrogated by the lead counsel Andrew Kasirye that the role of her office was recording land titles as issued by the district Land boards and thus the blame should be put on the district land officials at Wakiso. "The people who collected the money should pay it back. My lord, commissioners I earlier stated that the controlling authority is the owner of the land. [in] land registration, the registrar is at the tail end of the process of titling. Squarely put the blame on the district land board, the controlling authority", she said. Kasirye interjected asking: "What is the purpose of having a registrar? A registrar is skilled in matters of land law. Are you suggesting to this commission that being at the tail end, your officers are mere rubber-stamps. Should we recommend that we remove them?". The 1995 constitution puts all wetlands and forest reserves in custody of government for the people of Uganda. A gazette notice was issued in February 2013 and most of the controversial land tittles were issued between March 2013 and December 2014. The Legal Affairs director Christopher Gashirabaki had earlier informed the commission that following a gazette of land to be covered by roads, UNRA takes charge and no land tittles can be issued to the alleged owners. However, the Land Registration department went ahead to issue land tittles and leases in the said areas. 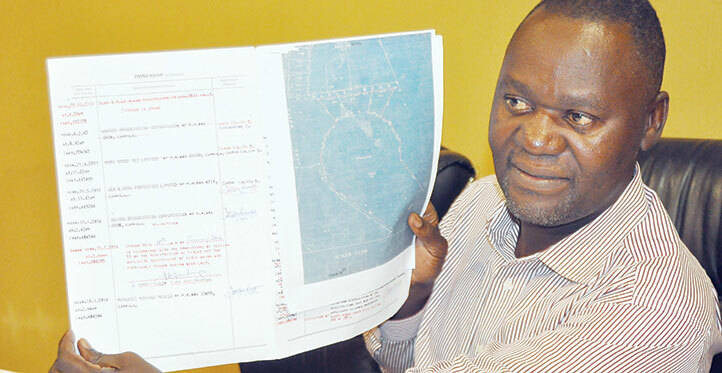 Among those given the leases and claimed compensation is Minister of Land, Housing Development Daudi Migereko for his land in Munyonyo. The Minister had in February written to all stakeholders halting further activities on the land. He is set to appear and give details to claims of influence peddling, ownership of illegal land tittles in the Express Highway land etc. When asked if her department took dual diligence to verify the titles, Kaluta said "My lord, commissioners, land registration is a process where the department of land registration is at the tail end. There is another department of administration which does supervising, monitoring and guiding controlling authorities. I believe the department of land administration must have informed the controlling authority audibly." Kulata is to appear again on Monday to answer on fraudulent compensation in the Hoima-Kaiso-Tonya road project as well as avail more details in relation to the Kampala Entebbe Express Highway compensation. Umeme shareholders have rejected ministry of Gender, Labour and Social Development permanent secretary Pius Bigirimana as one of its board of directors. The shareholders, at their annual general meeting held at Sheraton Kampala hotel voted by a simple majority against the inclusion of Bigirimana on the board for the next one year. Bigirimana had been nominated by the National Social Security Fund (NSSF) as a non-executive director of Umeme. NSSF is the biggest shareholder in Umeme and is partly under the ministry of Gender, Labour and Social Development. Other nominees included Anthony March, Andrew Buglass, Stephen Emasu and Riccardo Ridolfi. After the nominees presented their credentials, they went out to allow for a vote, after some shareholders refused to endorse them without a vote. After a simple vote, the shareholders accepted all other nominees except Bigirimana. They now join the board led by Patrick Bitature with members Gerald Sendaula, Florence Namatta Mawejje, Pieter Adriaan Falling, Selestino Babungi, the managing director, and Florence Nakimbugwe Nsubuga. Directors who resigned from the board are Charles Chapman, a founding management director of Umeme, Stuart David Michael Grylls, Christopher Nicholson and Adrian Mucalov. A source that attended the meeting told URN that the shareholders rejected Bigirimana because they were uneasy about his tainted image over alleged corrupt practices. When URN arrived at the venue of the closed meeting, Bigirimana was moving out, apparently soon after being rejected. Commenting on the rejection of Bigirimana at a press conference on the sidelines of the meeting, Bitature said it was the voice of the shareholders who have the powers to appoint the directors. Bitature said some shareholders opposed the nomination of Bigirimana but declined to divulge the reasons. He said if NSSF, which appointed Bigirimana, if aggrieved it can still demand for a poll, by virtue of its shareholding power. Meanwhile, the shareholders approved a dividend of Shs 7.5 per share, and Umeme will role out Shs 12 billion to its shareholders. In 2014, Bigirimana launched an anti-corruption book, Corruption; A Tale of Two Wolves in Sheep’s Clothing but was accused by legislators and some members of civil society of failing to take responsibility when over Shs 50 billion of donor money meant for Karamoja and post-war reconstruction of northern Uganda was stolen under his watch at the Office of Prime Minister. Last week, Bigirimana also came under scrutiny before the land probe commission after he reportedly requested and received Shs 504 million from the Land Fund in 2016 for 50.5 acres of land on plot 5 Bulemeezi, block 103 that had been encroached on by squatters despite not qualifying for the compensation. "Because you knew it was not a normal transaction, you knew Mr Bigirimana that you did not qualify why didn’t you return that money to government. We know you as a corruption free man, zero corruption. That is the concept that you [portray] but am a bit out for whether you stay in honour of that in view of these transactions that you have made", said land probe commissioner Robert Ssebunya. The commission's lead counsel Ebert Byenkya said that Bigirimana's documentation is covered in inconsistencies and that he did not qualify for compensation. According to Byenkya, the first registration dated May 14, 2004, was in the name of Joseph Nsubuga, the administrator of the late Nsubuga and the second registration of Fenekansi Kalyesubula strangely captured for a previous date of May 13, 2004. Bigirimana's registration on the land title is April 19, 2008. Bigirimana told the commission that he never paid attention to the dates, triggering questions on the intent of the purchase of the said land and a debate on how government officials are conniving to swindle resources set aside for the common man. Bigirimana pleaded that he never got to know that he did not qualify for the compensation but if the commission thinks he did not qualify, he is ready to follow their recommendation. Recently, in an interview with CBS radio after being ordered to vacate Nommo gallery, Security minister Gen Elly Tumwiine branded Bigirimana and secretary to the treasury in ministry of Finance, Keith Muhakanizi as "thieves". “Both Pius Bigirimana and Keith Muhakanizi are thieves, I told them point blank in their faces, they are the thieves in prime minister’s, they are accounting officers according to section 55 of the finance act, if you lose money, you are held responsible,” Gen Tumwine said. Bigirimana's Gender ministry had demanded that Tumwiine starts paying rent for using Nommo gallery but Tumwiine argued, saying the gallery was given to the artists by then President Milton Obote and that its not government property. The Inspector General of Government (IGG), Ms Irene Mulyagonja, yesterday interrogated Ms Justine Bagyenda, the Bank of Uganda executive director for commercial banks supervision, over illicit accumulation of wealth. Ms Bagyenda was thrown into the eye of the storm after a whistleblower petitioned the IGG to investigate her over accusations of amassing wealth. Although Ms Bagyenda’s leaked bank accounts, which showed that she was holding billions of shillings in fixed deposits was not included in the whistleblowers petition, sources close to the meeting told this newspaper that the IGG questioned her on the same. Diamond Trust Bank and Barclays Bank have since issued public apologies over the leakage of Ms Bagyenda’s account details and threatened disciplinary action on their staffs. Sources at the Inspectorate told Daily Monitor that, Ms Bagyenda was asked to explain sources of the money that she accrued on several bank accounts and how she accumulated the wealth that is attached to her name but she failed to furnish the Inspectorate with evidence detailing how she has amassed the wealth under her name. According to sources, she tried to explain but there was no documentary evidence to back her income and assets details. She promised to furnish IGG with additional documents detailing how she got the various assets. Ms Mulyagonja yesterday confirmed that Ms Bagyenda was interrogated over potential illicit accumulation of wealth but declined divulging the next course of action following yesterday’s interview. “We are doing an income, assets and liabilities verification in line with the Leadership Code Act,” Ms Mulyagonja said. Mr Dickwitington Kimeze, a concerned citizen, through his lawyer, petitioned the IGG on August 6 2017, claiming that he had information about properties belonging to Ms Bagyenda. The petitioner claimed that Ms Bagyenda owns various prime properties, including condominium plans at Makerere Hill Road and Sunderland Avenue in Bugolobi and plots of land at Kimera Close and Balikudembe Road. Mr Kimeze tipped the IGG that Ms Bagyenda may not have officially declared the same properties to the IGG as required under the Leadership Code Act. If Ms Bagyenda is found to have breached the Leadership Code Act, the unexplained properties may be confiscated by the government. Section 5 of the Leadership Code Act states that a leader who commits a breach of the code under subsection (7) shall have the excess or undeclared property confiscated and forfeited to the government. Although Ms Bagyenda was not readily available, when contacted, Ms Ali Munira, the spokesperson of the Inspectorate of Government, also confirmed that Ms Bagyenda was interrogated by the IGG. She however, declined to divulge details of the interrogation on grounds that the inquiry may be compromised. “Yes I can confirm that she was here. Definitely it was to do with the matter under investigation [the alleged accumulation of wealth]. We cannot specifically say what the interview was about because that will not help but it was part of the process of the investigations we are conducting,” Ms Munira. The Leadership Code Act demands that a person shall within three months after becoming a leader and thereafter every two years, during December submit to the IGG a written declaration of the leader’s income, assets and liabilities. Section (7) of the Leadership Code Act: Where a declaration is made by a leader in respect of himself or herself or any person under this section, where the leader or that person is found to be in possession of assets and income disproportionate to the known source of income which he or she cannot satisfactorily account for, the leader shall be taken to have breached this Code. KAMPALA. Ministry of Finance employees who witnessed the arrest of two of their senior colleagues that the President has accused of pocketing bribes from investors, have described the Monday episode as “one of a dramatic scene only seen in a detective movie." According to eye-witnesses, at about 3pm on Monday, a group of seemingly “mean-looking security men” disembarked and immediately sealed off all exit avenues at the Ministry of Finance headquarters. Some appeared clad in police uniforms and others in plain clothes as business suddenly grounded to a standstill as visitors and staff entering the Ministry of Finance building on Sir Apollo Kaggwa Road in Kampala, were caught in the muddle. Others who tried to exit the building were blocked from inside and were left puzzled during the operation that lasted nearly three hours. For fear of infiltration, the President according to State House sources, did not involve many people in the plot to trap the two senior officials, Mr Charles Ogol, the principal finance officer, and Mr Geoffrey Turyamuhika, a senior economist who had reportedly asked for a bribe. The investors, according to officials in the Ministry of Finance, gave unspecified amounts of dollars to the two suspects who work in the Aid Liaison Department of the ministry. But before they left the office, security operatives cut off the premises, rounded up the suspects, handcuffed them and impounded the dollars as exhibits. “It was like a detective movie,” one of the sources in the ministry of Finance said of the Monday drama. As soon as the IGP got the confirmation from his men, he called the President to deliver “the good news” and planned to have a face-to-face meeting at State House the next day. But the meeting, according to sources, was choreographed in the prism of “public relations” since the two men (Kayihura and the President) had previously discussed the nitty-gritty of what has been dubbed, operation Kisanja hakuna mchezo. However, because of the significance of the operation, it’s not yet clear whether Finance minister Matia Kasaija, his deputies and Secretary to the Treasury, Mr Keith Muhakanizi, knew about it. When contacted yesterday to comment on claims that the Ministry had turned into “a den of thieves” picking bribes from investors, he simply said “that’s a police matter” and declined to elaborate. Realising that the news of the arrest was spreading like wildfire, the Finance ministry spokesperson, Mr Jim Mugunga, issued an impromptu statement, confirming the news. “I have told you, in this ‘Hakuna mchezo’ period of no more jokes. Anybody involved in the act of asking for bribes will be handled harshly under the law,” remarked the President. In the meeting with the IGP at State House Entebbe, Mr Museveni reportedly noted that taking bribes has become a habit in Public Service and particularly Ministry of Finance, and Economic Planning. He said people, such as the two officers who have been arrested, and who take bribes, do not care about the country but only themselves. Confirming the narrative from the sources, the President reiterated that the two officials from the Ministry of Finance and Economic Planning who have been arrested, will appear in court for trial very soon because they were caught red-handed. Warned. Speaking at the commissioning of Riham factory in Kawempe Division, Kampala last week, the President lashed out at such workers likening them to ‘rebels’ he fought in the early 1980s that led him into power in 1986. He said: “… industries like this one owned by this young man (Hariss International Ltd, director, Mr Yasser Ahmed) add value to local and imported raw materials and create jobs. There are some civil servants who solicit for bribes from investors and end up blocking such investments. So join me and we fight these fellows who are denying you jobs,” he said. “There are government workers who delay development work. In the new government, that will not be there. Before, we had a few educated workers and would not dismiss these people but today that has changed,” a statement by the Presidential Press Unit quoted Mr Museveni as saying at the Labour Day celebrations held at Duhaga Senior Secondary School in Hoima District on May 1, 2016. Facts. “I have some information about government people who have been asking for favours from investors and this must stop or else people will be embarrassed. What I am talking about are facts and it is a great shame… You should not ask for favours from investors to pay school fees for your children or do this and that. If you have problems, call a clan meeting and solve it as a family but not through corruption,” Mr Museveni said as he closed a two-day Cabinet Retreat on September 2, 2016. Crispy Kaheru, Coordinator of the Citizens’ Coalition for Electoral Democracy in Uganda. UGANDA, KAMPALA. Three former senior accountants of Mubende Referral Hospital have been sent to jail and ordered to refund Shs200m to the government. The Anti-Corruption Court sentenced the former Senior Accountant, Mr Henry Okori Okumu to two years’ imprisonment, Mr Kasangaki Aston Kyomya, principal accounts assistant to three years and Mr Peter Okot, senior accounts assistant to four years in prison. The Kololo based Court also ordered Mr Okumu to refund Shs30 million, Mr Kyomya Shs20 million while Mr Okot was ordered to refund to government Shs150 million. The court decision came after the trio were convicted of embezzlement, causing financial loss to government, abuse of office, false accounting and conspiracy to defraud. 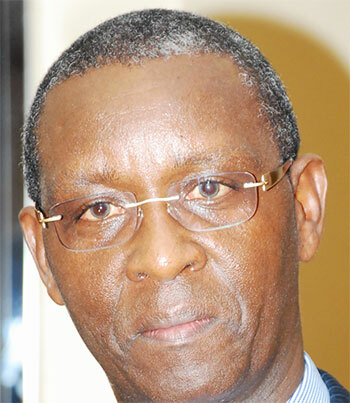 Justice Lawrence Gidudu held that Shs29, 300,000 and Shs193, 794,494 was inflated and stolen from a combined total of 85 cheques which were clearly tampered with by way of altering the initial figures and words to read higher amounts. “…I find the two (Okumu and Kyomya) guilty of theft of the money. Accused 2 is responsible for Shs29.3 million from a total of 10 cheques and accused 3 (Okot) is responsible for Shs193 million from a total of 75 cheques,” ruled Justice Gidudu adding that it is not in dispute for Mr Okot to be charged with false accounting since he was the accounts clerk at the rank of senior accounts assistant. The judge also observed that the three convicts acted with impunity when they despised Doctor Nkurunziza as accounting officer and had no respect for him to the extent that they would do as they pleased in matters of finance. “I also note that while the convicts were employed to safeguard public resources, they turned around and did the opposite. They took advantage of a weak governance structure that did not even have a board to govern the hospital. They also took advantage of a hopeless internal audit system that allowed them to falsify payments and forge accountabilities,” Justice Gidudu added. Court heard that the three convicts while acting as back agents would alter figures and words on cheques to inflate the final amount which they would steal. According to the judgment, in some cases they would forge the signature of the accounting officer and cash cheques or transfer money illegally for their benefit. Court held that Mr Okumu was culpable as head of accounts for approving illegal payments to suppliers not prequalified to supply goods to the hospital thereby causing financial loss and abuse of office. Justice Gidudu ruled that Mr Kyomya was guilty as bank agent for stealing money on inflated cheque payments and signing a forged inter account transfer in which a total of Shs67,645,628 was paid to illegal suppliers and abuse of office. “Accused 3 (Okot) is held culpable for stealing the money on inflated cheques, posting false entries in the cash book and abuse of office,” added Justice Justice Gidudu. Burahya County MP Margaret Muhanga who paid sh10b in cash to acquire a piece of land belonging to Uganda Broadcasting Corporation (UBC) has scoffed at her colleagues investigating the matter. “Hey stay cool. The Supreme Court, the highest in the land already made a ruling on the UBC land and Parliament cannot overturn it. 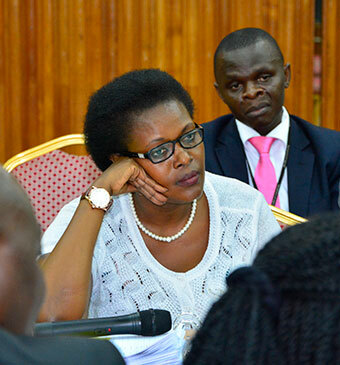 Period,” Muhanga said on Twitter a day after she was grilled by the House committee on state enterprises. The committee chaired by Bugweri County MP Abdul Katuntu is scrutinizing the Auditor General’s report for 2013/14. The committee is investigating the alleged fraudulent purchase of UBC land in Bugolobi a Kampala suburb. 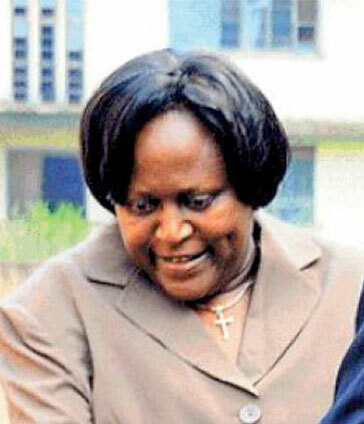 Muhanga told a committee that she bought the land from court bailiffs at a cost of sh10b which she paid in cash. According to Muhanga, the money was raised through the sale of cows, goats and donations from family members. The committee gave Muhanga up to Friday to produce a land title but she insisted that she had no title, arguing that it was cancelled by the Supreme Court. "You see, we are moving back and forth on this matter. This matter was concluded by the Supreme Court – the highest court in this country. Then, where does anyone – whether Auditor General or parliament come in?" Muhanga said. The Supreme Court has since cancelled Muhanga's land title citing irregularities in the process that saw UBC sell its land. The claim by Muhanga that she raised such colossal sums from selling goats and cows has spawned a heated and, a tad sarcastic debate on social media with some impugning the veracity of her statement. The transaction that saw Muhanga acquire the land in question is eerily complicated. By an agreement dated 14th February, 2011, UBC, at sh11.5b, sold the land in question to Haba Group – a company belonging to property mogul, Hassan Basajjabalaba. Three months later, Haba Group sold the land in question to Deo & Sons properties Ltd for sh22b. Surprisingly, then UBC Managing Director, Paul Kihika wrote a letter terminating the sale agreement to Haba saying the sale flouted provisions in the UBC Act. The land was sold without prior explicit permission of minister of information as required by the UBC Act. When Haba filed a case challenging cancellation of the sale, court upheld UBC's objection to the sale and dismissed the suit. Dissatisfied, Haba lodged an appeal in the Court of Appeal. However, before the case could be disposed of, the parties – UBC, Haba and Deo & Sons entered into a consent judgment in April 2013 to amicably settle the matter. In this arrangement, Haba and Deo & Sons executed a deed of assignment to SINBA (K) Ltd. Subsequently, SINBA (K) Ltd applied for execution of the consent decree and a warrant of attachment of the land was issued to Twinamatsiko auctioneers who proceeded to sell the land to Muhanga. UBC later successfully challenged sale of its land in the Court of Appeal and attempts by SINBA, Haba and Muhanga to challenge the decision in the Supreme Court proved futile. Muhanga is now claiming refund of her sh10b. When the parliamentary committee on Commissions, Statutory Authorities and State Enterprises (Cosase) opened an investigation into the mismanagement at the Uganda Broadcasting Corporation (UBC), particularly the illegal sale and transfer of the public broadcaster's land, many people familiar with the transaction began to question why Parliament was spending time digging up an issue already decided by court. But SULAIMAN KAKAIRE has found that the critics of the parliamentary investigation might be mistaken. This ongoing parliamentary probe into the land transaction involving Burahya MP Margaret Muhanga Mugisa, businessman Hassan Basajjabalaba and UBC has been expanded to focus not only on the substance of the transaction (fraud) but on whoever participated in the fraud and walked away scot-free. Whereas the High court, Court of Appeal and Supreme court have investigated the fraud and set aside the whole transaction, the two courts did not make a finding on the role played by individuals who executed the preordained scheme since this was not an issue before court. It is under this pretext that Cosase, a committee mandated with monitoring the management and performance of government entities, is conducting the probe based on the auditor general’s financial audit report on UBC (UBC) for the year ended June 30, 2015. According to a brief prepared by the technocrats, to facilitate and guide discussions of members in the investigation, the committee has to establish whether the management of the agency is in line with sound and prudent business management principles and practices. “If there exists some instances of mismanagement and fraud; and if so, who are the persons responsible? And to recommend appropriate action to be taken against such officers. Why it was possible for the irregularities raised by the AG’s report to occur; and whether there are now prudent and effective systems in place to avert such irregularities in future,” the brief seen by The Observer partly reads. As regards the land scandal, one senior member of the committee, who declined to be named, said their investigation is meant to establish how the transaction originated, who approved it and when, why it could not be detected by some institutions like Uganda Revenue Authority and the land registry. “We have to investigate and make a finding on all these issues. Thereafter, we shall send a report back to parliament and if it agrees with us, the Director of Public Prosecutions and the Inspector General of Government will take over from there to have these individuals prosecuted under the Anti-Corruption Act,” the member said. We understand that three former UBC top managers were charged in the Anti-Corruption court in connection with the land scandal. They include Chris Katuramu, Edward Mugisa Mugasa and Emmanuel Emoru. Indeed, this is the reason why the committee has invited the respective individuals that were involved in the management of UBC at the time of the scandal. Others invited to attend the proceedings include former managers at UBC; Ruthra Kamukama (Finance and Administration Manager), John Patrick Kateba (accountant), Ephraim Nyangire (acting risk and internal audit manager) and Eliud Atwine (transport officer). Speaking to The Observer on Saturday, Katuntu said the intention of their investigation is to answer things that court did not or put in effect what court could not. “If you look at the list of witnesses, some of them were not in court. Even those that went to court were not penalised for their actions because that was not the subject matter before court,” he said. Although the title was delivered, it was not clear whether Muhanga would get back the money. In an interview with The Observer, Busiro East MP Medard Lubega Sseggona, a member of Cosase, told us that as far as he knows, no money moved from Muhanga to UBC. “There is no evidence to that effect. If she said to have paid 10bn, then there is need to prove that and if not, it points to the fact that maybe she was a mere conduit,” he said. For his part, Lubaga North MP, Moses Kasibante, another member of the committee, disclosed that by claiming that the money she paid was got from selling goats, it was intended to shield the fact that she did not pay that money. “If she had claimed to have got the money from the bank, it could have been easy to find out, how he got it; from who? and during what time was the money paid?” Kasibante. But why is it important to know whether Muhanga paid money or not? Sources on the committee have told us that the intention of this is to establish whether she was a proxy or not, and if she was, who then was behind the scheme. “This is part of the reason that the land title has been surrendered to stop the pursuit. There is information that the investigations were leading to some top people in government,” said one source. Well, it may be the wish of the culprits that the committee puts the matter to rest since the title has been surrendered but Katuntu insists that appropriate action will be taken at the end of the investigation. “We have to recover all the land that was illegally transferred from UBC. We shall do this for all government entities,” he said. The Observer understands that the committee has requested for the list of all UBC property that was transferred or sold to private individuals and it intends to put the registrar of title and Uganda Revenue Authority officials on the spot to answer queries regarding some of these transactions. For the registrar, the committee is interested in knowing how two certificates of title could be issued within an interval of three minutes. According to the brief seen by The Observer, the committee is to investigate a query raised by the auditor general questioning the size of UBC’s assets, debts and the corporation’s outstanding obligations amounting to Shs 30.8 billion. They include trade creditors (Shs 12bn) and other creditors (Shs18.8bn). According to the AG, all trade creditors (Shs12bn) were not adequately-supported by source documents like invoices, contracts completion certificates and agreements. The committee is also investigating why 247 staff have no valid contracts and others have expired contracts as far back as 2009. “Further, a review of the UBC staff and the salary structure revealed that the salaries, terms and conditions of service of the corporation were last set in 2005 at the inception of UBC and have become outdated and inadequate contrary to the UBC Act that mandates the board of directors to determine from time to time the structure of staff levels and terms and conditions of service. A leaked report by the Ministry of Gender reveals key youth ventures where millions of shillings have been plundered in direct theft or through collusion with relatives of the culpable officials. The ministry’s report titled “Status of Problematic Youth Projects” implicates community development officers (CDO) in charge of the Youth Livelihoods Programme (YLP) in districts. The report says government has recovered some money as investigations are still ongoing. About Shs100m has been stolen by those directly in charge and other districts leaders. The report cites Kibuku District where members of Goligoli Youth Improved Goat Rearing Project in Kagumu Sub-county withdrew Shs3m and shared it. Only one member of the group bought “some goats”. The other half (Shs3m) is said to have been taken by one of the group leaders (names withheld) who is currently on the run. The matter was reported to police and investigations are ongoing. In Katakwi District, an official of Usuk Sub-county colluded with his son who works with Koritok Produce Buying and Selling, to hijack a youth project worth Shs10m. The LC3 official, according to the report, was arrested by police on the orders of the Resident District Commissioner. So far Shs7m has been recovered. In Bundibugyo District, government has failed to trace the beneficiaries of more than Shs8m and Shs12m under Nyahuka Central Unisex Salon Group and Bundukuyali I Cloth Designing and Tailoring Project. This group was selected by the Town Council authorities but the ministry team verifying the projects could not find this group and it appears non-existent. The case is being handled by the RDC. Also in Bundibugyo, 12 members of Bundikahungu V Unisex Salon Youth Group in Nyahuka Town Council received Shs8m from government but when the ministry visited, the group members did not know that their project had been funded yet the money had been withdrawn by unknown people. The police are pursuing the culprits and have the money recovered. In Mubende, a community development officer and focal point person with YLP is implicated in manipulation and tricking some groups in the district and taking money from them by promising to pay back with a high interest. This case, according to the ministry’s report, has been categorised as “general abuse of office and corruption by a district officer”. When contacted at the weekend, both the Youth minister, Ms Evelyn Anite, and the Permanent Secretary, Mr Pius Bigirimana, confirmed the report findings. The minister said the projects status report was compiled by the ministry’s technical team as part of its monitoring and evaluation docket. Asked what the classification of districts as “hotspots” means, Mr Bigirimana said, “prosecution of the culprits named in the report is going to take place because they have been identified with the help of the police and the geographical information system (GIS) maps we developed as a monitoring and evaluation tool”. “They can afford to hide but let them know they cannot run away because we know the people we gave the money and who signed for it. Every coin must be recovered. We have recovered most of the stolen funds and we are continuing to pursue the culprits. Let them know this is not business as usual, whoever get the youth money must account for it,” Mr Bigirimana added. However, even with the abuse of youth funds in some districts, MPs led by Ms Betty Ocan Aol appreciated the programme rollout unlike the Youth Venture Capital Fund, which ministry officials described as “a dead body”. The districts include Mukono, Mityana, Kampala, Wakiso, Buikwe, Lwengo, Ssembabule, Kalungu, Mubende, Kalangala, Mayuge, Kamuli, Busia, Tororo, Kibuku, Kumi, Napak, Pallisa, Alebtong, Otuke, Adjumani, Apac, Pader, Isingiro, Ntungamo, Rubirizi, Kamwenge and Ntoroko. Sixteen government officials shared $1m to influence the award of the $8.5b (about Shs22 trillion) tender to build the Standard Gauge Railway line, the ongoing inquiry into the controversies surrounding the deal heard yesterday. Mr Charles Muganzi, the former permanent secretary in the Ministry of Works, named officials he said pocketed bribes from one of the Chinese firms fighting for the coveted deal. Mr Muganzi, who was the PS when negotiations for the deal were initiated in 2012, first requested journalists be expelled from the proceedings before delving into details of how money exchanged hands as different government officials canvassed support for either China Civil Engineering Construction Corporation (CCECC) or China Harbour Engineering and Construction Limited (CHECL). Mr Muganzi’s revelations come days after President Museveni told the inquiry that officials who have taken bribes from the deal will be exposed when the Inspector General of Government (IGG) Justice Irene Mulyagonja begins prosecuting the culprits. Though Mr Muganzi declined speaking to journalists after, Mr Kafeero Sekitoleko, the Nakifuma County MP, who is chairing the committee, later confirmed that Mr Muganzi revealed officials from several government ministries. “We have the names but they have been given to us in confidence and they are protected by the law that they can be heard confidentially. Our interest is getting information. Let us get to the root of the matter. If some people are not free to speak in front of the cameras [media], why don’t they get the benefit,” Mr Sekitoleko asked. The government initially signed a memorandum of understanding with CCECC but this was later controversially cancelled by the Works state minister, Mr John Byabagambi. The deal was then awarded to CHECL, triggering a court suit that is still on-going. Meanwhile, the committee proceedings might run into trouble if the Speaker of Parliament, Ms Rebecca Kadaga, agrees with a group of MPs who want the committee disbanded, accusing it of bias. MPs under their umbrella organisation, the African Parliamentarians Network Against Corruption (APNAC-Uganda Chapter), have written to Ms Kadaga protesting the conduct of the probe committee. In a January 14 letter, the MPs specifically contest why President Museveni directed the committee members to secretly interview Ms Rosa Whitaker, the former Assistant US Trade Representative for Africa. “What has come out in the media has left us MPs and the public at large baffled by the manner the committee is handling its business which is improper and not in consonance with our rules of procedure,” Western Youth MP Gerald Karuhanga wrote in the letter. “We are, therefore, requesting that the committee, particularly its leadership be reconstituted if the report is to be credible and for the reputation of the August House,” reads part of the letter to Ms Kadaga. interact after signing the Shs740b grant in Kampala yesterday. Finance Minister Matia Kasaija used yesterday’s signing ceremony of the new $226 million (about Shs740 billion) Global Fund grant to warn corrupt government officials who might be tempted to swindle the money, saying the law will catch up with them. Mr Kasaija, whose ministry is one of the principle recipients of the grant, said all accounting officials should refrain from diverting the funds meant to offer care and treatment for HIV/Aids, malaria and tuberculosis patients in the country. “Government will ensure that these funds are used and accounted for under the new Public Finance Management Act, and I am warning accounting officers that anyone who is involved in messing up this fund will be laid off as you have seen in the media where some have already been dismissed,” said Mr Kasaija. The ministry of Finance is the principal recipient of $176 million (about 570 billion) meant for the support of Uganda’s fight against HIV/Aids together with another $21 million (Shs68b) intending to support the country’s prevention of TB, $14 million (Shs46b) for health systems strengthening. The Aids Support Organisation (TASO), which is the second principal recipient of the funds, will receive $6 million (Shs19b) for the beefing up HIV/Aids response in the non-public sector. The grants are an additional to the $148m (Shs480b) malaria grant which was signed in December last year. Speaking as the chief guest, Prime Minister Ruhakana Rugunda appreciated the Global Fund for its continuous support towards the health of Ugandans. “We will provide the leadership and governance required to ensure programmatic and financial accountability and credibility to all our development and implementing partners,” Dr Rugunda said. The Minister of Health, Dr Elioda Tumwesigye also reiterated that he will provide transparency and accountability of the funds as the line minister. Amount allocated for health systems strengthening. This Global Manager is not considering the pain the developed countries are going through to pay their taxes in aid projects in third world countries. They do not gain much from prosecuting officials who steal these funds. Now that Uganda is going into a commercialized national election this fund should have been delayed until after the on coming election violance. to go through documents during hearing yesterday. KAMPALA. The commission of inquiry into the alleged mismanagement at Uganda National Roads Authority (UNRA) yesterday handed the managing director of a consulting firm to police over alleged fraud. The commission chaired by Justice Catherine Bamugemereire directed police detectives to take over investigations into the alleged fraud against Mr Ronald Luberenga, the managing director of Mapcon Consultants Limited, in connection with valuation and compensation of people affected by the construction of the 92km Hoima-Kaiso-Tonya road in Hoima District. Mr Luberenga appeared before the commission and testified that his company did not pay any tax to government during the contract period of 12 months although the company was paid up to 70 per cent of the amount. “We did not pay any corporation tax except the withholding tax by UNRA of six per cent,” he said. The commission heard that up to date, the compensation exercise is not complete due to pending appeals and protests while huge sums of money was allegedly paid in compensation of ‘ghost’ land owners. Mr Luberenga also told the commission that Mapcon submitted its final reports for the affected people in 2013 contrary to the documents indicating that the final report was submitted to UNRA in June. The testimony comes hardly a week after local leaders from villages that were affected by the road construction accused the firm of allegedly defrauding them during the compensation exercise. Local council leaders testified that officials of Mapcon, which was hired to handle valuation and compensation of the affected people, under valued their property leading to underpayment. The evidence given before the commission will form the basis of the report after inquiring and investigating into the alleged anomalies in UNRA. The commission is mandated to investigate and inquire into the procurement and contract management processes by which UNRA awarded contracts for national road works. It also seeks to investigate and inquire into the acquisition of land by UNRA and generally to examine the basis and methodology employed by the Authority to compensate land owners and persons affected by national road works.